Check with your salesman for details! The Spartan Mosquito Eradicator is the easiest of mosquito control solutions. • Easy to install - Hang along the property perimeter. • Does not require power - Just add water and shake. • Provides continuous, long range protection. • No hazardous mists, airborne particulates, or spray-on chemicals. • Extremely effective - Significant decrease in population within 15 days, up to 95% mosquito control for up to 90 days. Eradicates females and males before they can breed. • Low cost maintenance - Just add water, shake, and replace at least every 90 days. 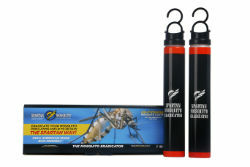 After the “first bite” of the season, deploy Spartan Mosquito Eradicators at approximately six feet off the ground, within 180 feet of each other, along your property line. Be sure to place the Spartan Mosquito Eradicators away from where people gather since mosquitoes will gather near the Eradicators. Once Spartan Mosquito Eradicators are deployed, they create a barrier giving the mosquitoes a target that has the same attraction triggers as people and animals. Once mosquitoes feed on the water solution they die before they can breed again. The mosquito population in the area will then decrease in 15 days or less and up to 95% of your mosquito population will cease to exist for up to 90 days. The Spartan Mosquito Eradicator is less hazardous than spray-on repellent, it takes 10 minutes to set up, and it lasts up to 90 days. Its simplicity makes it perfect for residential, governmental, and commercial use. Simply add hook to black cap, remove white cap, add warm potable water to fill line, replace white cap and shake, remove white cap, attach black cap, and hang on edges of property. Place one box per acre on your property (more than one box can be used). 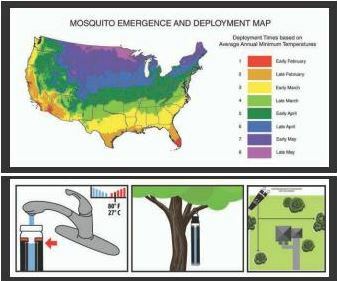 Use two boxes per acre to catch up if deploying for the first time and mosquitoes are already established. Ideal placement is in opposite corners of the property, hanging near a tree trunk about 6 feet above the ground in shaded areas along the property line.